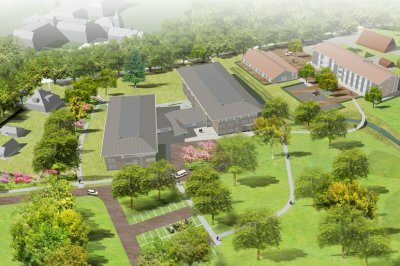 The municipality of Almelo together with housing association Sint Joseph want to breathe new life into the outdated Rumerslanden neighbourhood in the Sluitersveld district, and this way give a strong boost to the quality of life there. Based on the existing, recognisable road structure, a creative, accessible and varied residential area should be created, a district with a large heart. 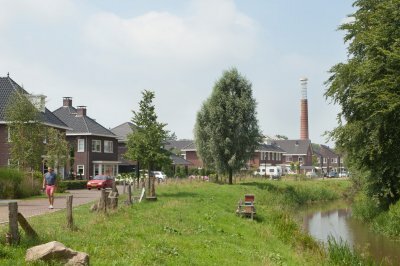 In this typical post-war reconstruction district, a plan has been designed in collaboration with contractor Nijhuis Bouw and the architecture department of IAA Architecten, in which the long, homogeneous, low-quality residential blocks have been replaced by homes with a contemporary garden village character. This is further reinforced by giving a lot of space to greenery. An efficient subdivision is created by placing six perpendicular open building blocks between the kinked street pattern. Between the blocks, four wedge-shaped yards are equipped with greenery to create a pleasant atmosphere around the houses and offer children the ideal playground in a controlled and socially safe environment. The plan orientates the new homes both at the road as well as along the new green yards, resulting in a diverse streetscape. Seen from the street perspective, there is an alternation between side walls and front walls. This emphasises the small-scale, almost village-like character and creates an informal atmosphere. Instead of the 160 demolished terrace houses, the design has 108 detached, semi-detached and rows of four. This means a 'dilution' compared to the previous situation, which makes it possible for the district to make the desired qualitative leap. The architecture explicitly makes no distinction between rental and owner-occupied homes, so that the unity of the district will be clearly discernible.